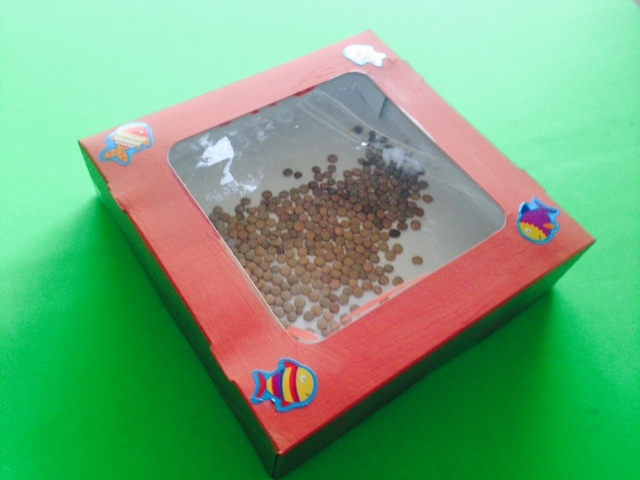 4 Recycled Thanksgiving Music Crafts! 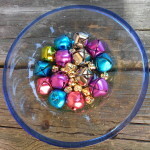 Isn’t it great to find ways to use items that might be a part of your holiday celebration. Instead of tossing them into the trash, you can turn them into treasure. 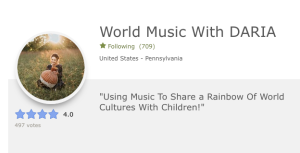 Well, maybe not treasure, but definitely great kids music crafts that can provide hours of fun while you’re relaxing during or after a wonderful celebration. 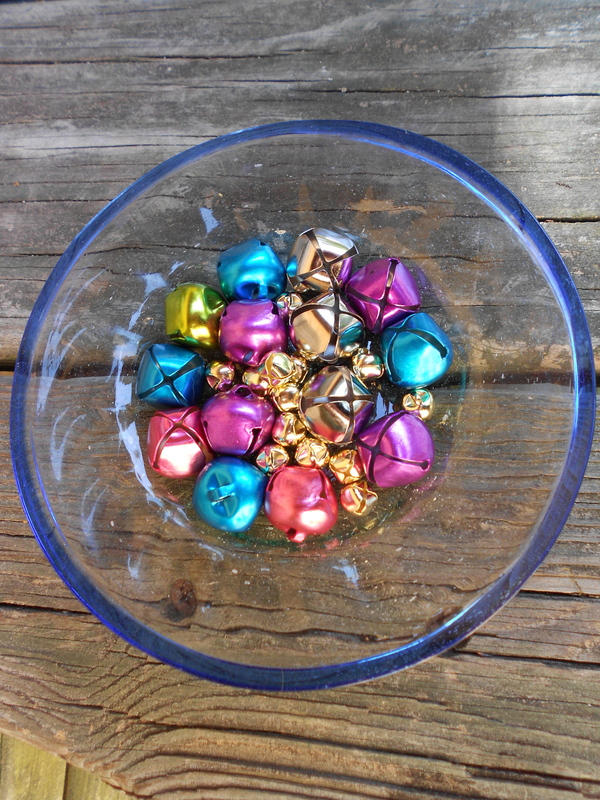 Here’s our 4 fav holiday craft re-makes. Seriously, is there a better way to get the whole group together than to bang a gong? 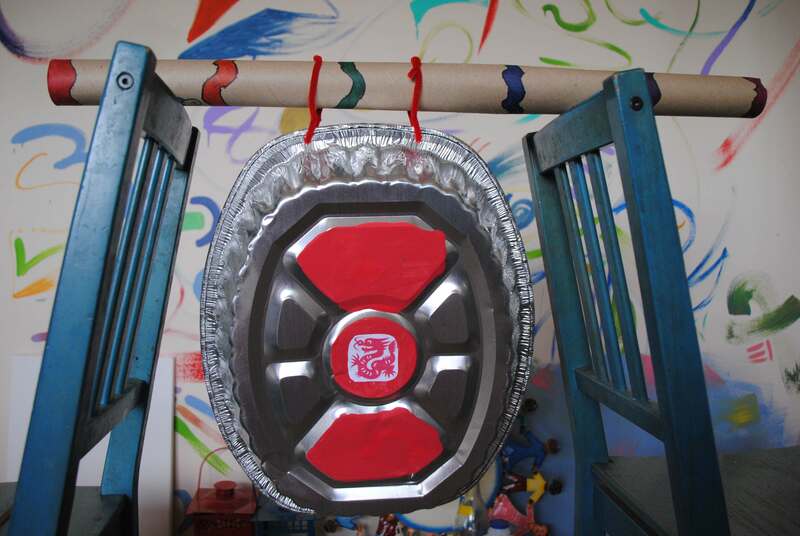 Let the kids use the extra turkey roasting pan to create this wonderful Chinese-style gong to mark time at your celebration. Decorate it with your Chinese zodiac animals – the chart of Chinese Zodiac animals is part of this pdf – or just apply pure creativity! We love this craft. There’s a cool little window built right in so you can see what’s making the sound of the sea in your ocean drum. 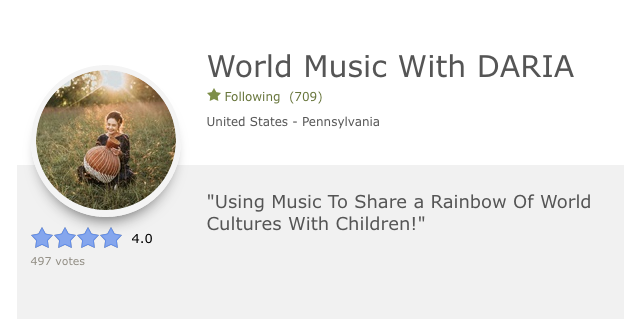 This simple craft sounds remarkable and is wonderfully relaxing! Who doesn’t love a hand drum? 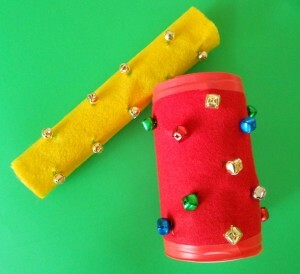 Here’s a super simple way to turn the empty coffee cans into a child-size hand drum. A Beater For Those Drums! 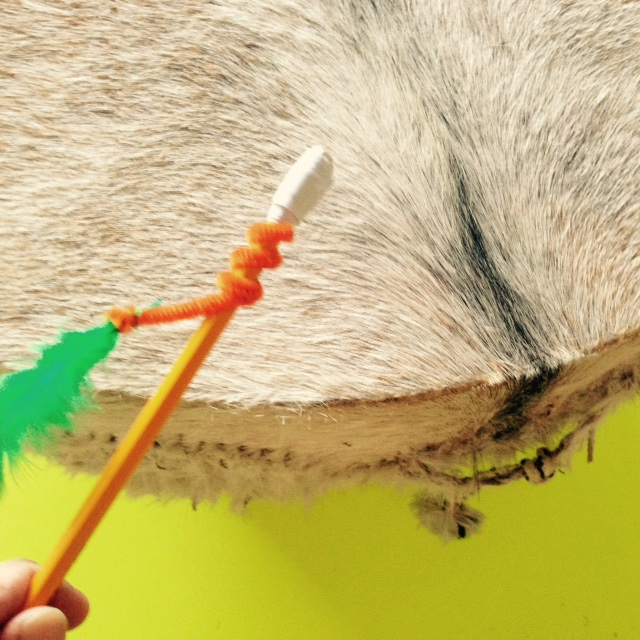 While you’ve got a gong and a hand drum, you might want to make your own easy beaters. Opt for unsharpened pencils or go for a nature walk and find sticks that can create sturdy basic beaters for any drum you may have or make. Confetti! Who doesn’t love it? Although it can be messy, it’s a fun part of so many celebrations. 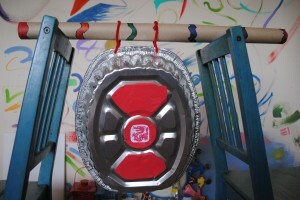 And we often add it to many of our recycled rattle projects to add color and a bit of extra merriment. So what’s better then colorful confetti? Answer: recycling holiday wrapping to create your own endless supply of fun…con…fetti! 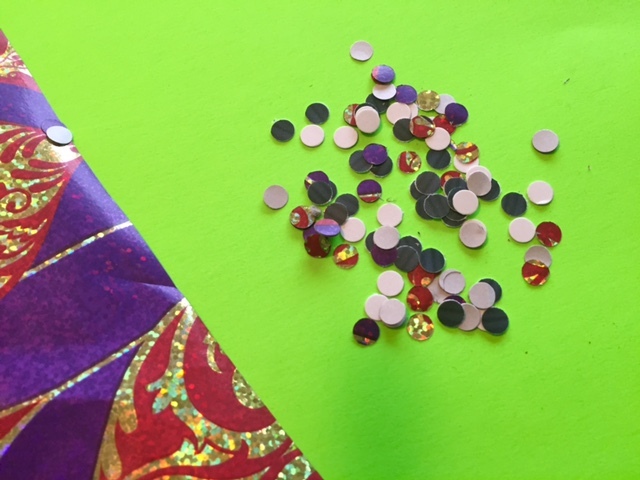 Here are three ways to make different kinds of confetti from extra holiday wrapping supplies. Naturally, if working with younger kids, be aware of safety issues with scissors and substitute kid shears. 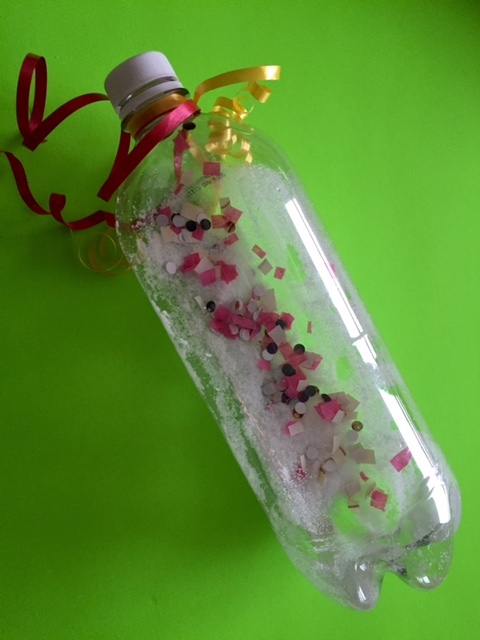 If working with very young children, you may want to make confetti in advance then allow them to choose or pour confetti through a large-mouthed funnel into your holiday rattles or crafts. So don’t throw out that holiday packaging! Here’s how to make it part of your next celebration. This is clearly the easiest method and makes perfect little circles. Just cut squares of used wrapping paper (the brighter, the better) and put several together before you start punching. You’ll easily find how many paper squares you can put together to get the most amount of confetti without straining your hand and your hole punch. Other fun hole punches? 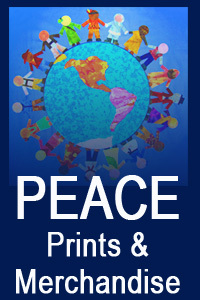 Craft stores often have hole punches with different shapes and sizes, like stars and moons. These make for wonderful additions to this project! 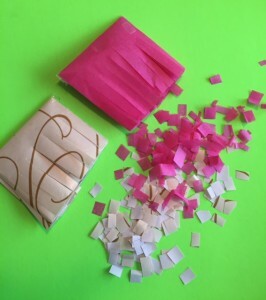 Cut squares of used tissue paper or wrapping paper and put about 4 – 6 together. Tape one side to keep the papers together. Then make long scissors cuts up toward the taped side, but not into the taped area. Once you’ve made these long vertical cuts, you can cut straight across (in the opposite direction) and it will yield nice little uneven squares of confetti. Have lots of used ribbon? This method yields a bit less confetti, but still makes colorful little squares. Simply hold 4 – 6 pieces of ribbon in your hand and snip across the top. You can also cut longer pieces and make mock shredded paper. Similarly you can curl ribbon and then cut the longer curls to add into your rattles. 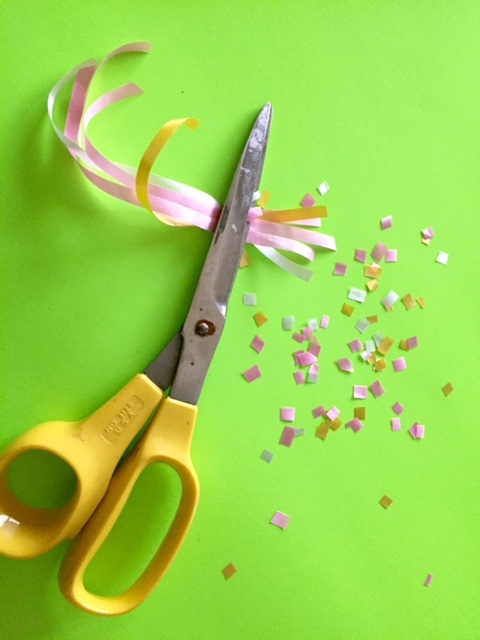 By far, the two most popular confetti crafts are rattles and confetti poppers. We have our rattle post below plus two different creative methods for MYO poppers (aka confetti cannons) in the links below. Here’s wishing you a happy and joyful celebration! 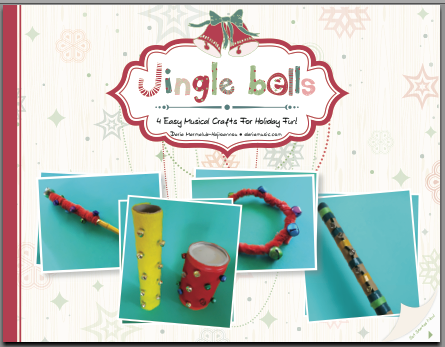 Jingle Tubes For The Holidays or Any Day! These are so much fun, why wait for the holidays to make some? 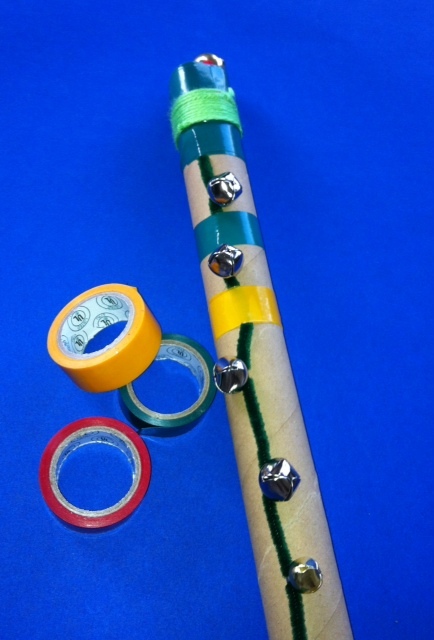 To make jingle tubes, start with these “found around the house” supplies. You’ll need either the inner cardboard roll from paper towels or a round container, such as an oatmeal, cornmeal container or a coffee can. You’ll also need a piece of felt large enough to fit around your tube. Plus, look for a bit of glue, a marker, safety pins and jingles and some colorful tape, if desired. Step 1 – Measure and cut a piece of colorful felt that will cover the cardboard paper towel roll or round container and leave a slight area for overlap. Step 2 – Determine where you want the jingles on the finished stick and use your marker to make small indications showing you where jingles will be pinned in place. 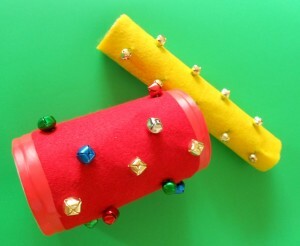 Step 3 – Pin each jingle with a safety pin on the inside part of the felt. Hold it up to the cardboard tube or container to check your work. Step 4 – If using a cardboard tube, glue the edges where the felt overlaps and staple the ends in place. Step 5 – If using an “oatmeal style” container, check the position of the jingles then glue the entire felt piece into play and allow the jingle tube to dry before using. Step 6 - For both projects, you might also wish to secure the felt in place with an additional piece of electrical tape. Shake jingle tube back and forth or up and down. Sing any of your favorite holiday songs along to a beat created by your jingle tube. Try one of your favorite songs slowly. 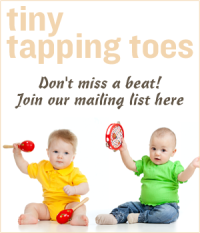 Try it quickly, keeping the beat with the jingle tube. 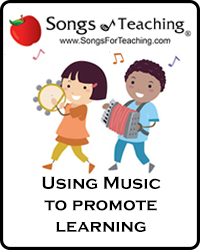 Play jingle tubes along with recorded music. 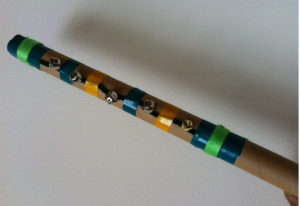 Make jingle tubes or color coordinated jingle tubes as part of any holiday music presentation.